Some momentous occasions deserve the best. A wedding, an anniversary, or a milestone achievement. The Madison was crafted with heirloom-quality in mind. Handmade custom covers and thick Seamless Lay-Flat Pages, prepare to be impressed with the Madison. A fully customizable photo design front cover with glossy cover coating is applied for an elegant and protective finish. The photo is then attached by hand to the leather cover color of your choice. 5 colors available for your full-grain leather cover: black, brown, coffee, red or pink. Why genuine top grain cowhide leather? Genuine top grain cowhide is a single hide, and not scraps of leather bonded together. Our covers are made with top grain cowhide leather without blemishes and are more rare and therefore more highly valued than bonded leathers. From panoramic shots of the wedding aisle to breathtaking landscapes, our Seamless Lay-Flat Binding brings a graceful refinement to every moment. Photos flow across pages and lay flat with unmatched fluidity and elegance. 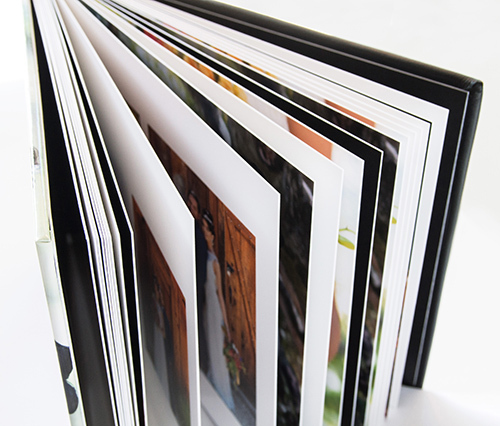 Photos are beautifully printed using industry-leading printers on thick, board pages. A Matte finish for a modern touch.